UPDATED: Sat., Jan. 6, 2018, 10:16 p.m.
Hanks spoke out against efforts to restore state agencies to pre-2009 levels, after recession-related cutbacks. “I just think we need to not be building our state agencies and have the money back at the local level,” she said. Actually five urban counties in Idaho – Ada, Canyon, Bonneville, Kootenai and Twin Falls – plus Bannock County contain 77 percent of Idaho’s population. Idaho also is becoming increasingly urban, as its urban areas are where the state’s growth has been occurring, according to census figures. BOISE – Idaho’s upcoming legislative session – which kicks off Monday with third-term Gov. Butch Otter’s final State of the State address – will tackle big issues in health care, taxes, education and ethics, and it will come as political leaders jockey for power in a contentious election year. “It’s going to be like the OK Corral – there’s going to be a shootout,” said House Minority Leader Mat Erpelding, D-Boise. That’s because lawmakers are taking sides among the candidates jockeying for the governor’s race next year. And some are running for higher office themselves, with sitting lawmakers looking to step up to posts including lieutenant governor and Congress. Every legislative seat, along with every statewide office, is on the 2018 ballot. “There’ll be an elevated level of rhetoric and posturing eloquence,” said House Speaker Scott Bedke, R-Oakley. But he said he’ll work to keep that in check. “We have the people’s business to conduct,” he said. Idaho still hasn’t expanded Medicaid, leaving 78,000 residents in a coverage gap because they make too much to qualify for Medicaid, but not enough to qualify for subsidized health insurance through the state insurance exchange. A citizens group is gathering signatures for a ballot initiative to expand Medicaid. On Friday, Gov. Butch Otter and Lt. Gov. Brad Little signed an executive order to authorize new, more affordable insurance plans to be offered in the state that don’t meet all the requirements of the Affordable Care Act, a move they can make now that Congress has repealed the individual mandate under the ACA. Little said last year, Idaho’s insurance rates went up 28 percent. “Today, Idaho is going to boldly take back our leadership that we had before in health care,” he said. Rival Tommy Ahlquist, another GOP candidate for governor in 2018, immediately derided the executive order as a campaign ploy, after Otter said he and Little will tour the state to educate Idahoans about it. State Insurance Director Dean Cameron said the new policies, for which guidelines still are being developed, could be available by March and could save Idahoans 30 to 50 percent on their premiums. But they’re only part of the solution, Cameron said. The Otter administration still is working on plans to seek two waivers from the federal government to make other health care changes. The new, cheaper policies would be targeted at uninsured people in the gap; Idaho’s insurance exchange and its plans would remain in place. Legislative leaders said Friday they haven’t yet been briefed on the new plan, and lawmakers will need to understand it before they decide if they’ll sign on. With state revenues strong, many lawmakers in the heavily GOP Idaho Legislature want to cut taxes, as do all three of the leading GOP candidates for governor. 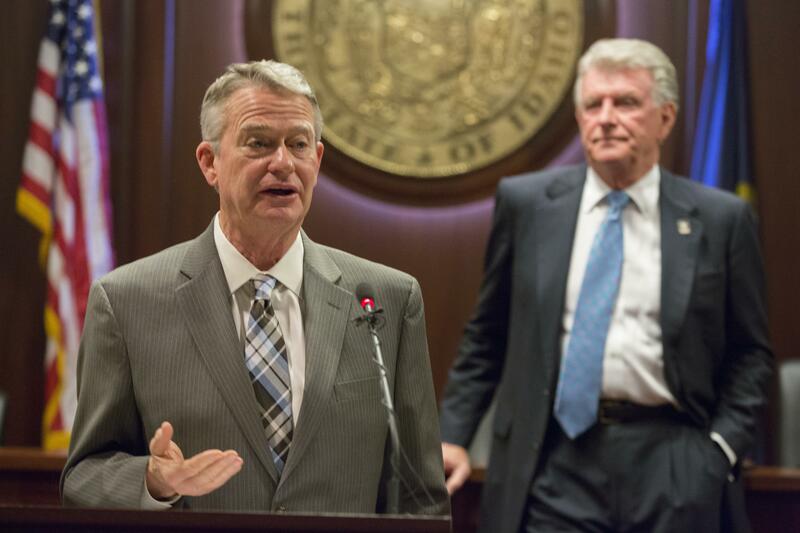 Last year, the Legislature passed a bill to remove Idaho’s 6 percent sales tax from groceries, but Otter vetoed it, and the veto was upheld by the Idaho Supreme Court. There’s also pressure to reduce Idaho’s personal and corporate income tax rates, which are higher than in most surrounding states. At the same time, federal tax changes will have a big impact on Idaho’s state budget, as Idaho’s income tax is based on the federal system, using federal adjusted gross income as its starting point. Lawmakers will need to decide whether to conform Idaho tax law to some or all of the federal changes, in addition to any changes considered in other taxes. A decrease in unemployment insurance taxes that businesses pay died last year amid fights over other tax cuts, but has bipartisan support; it’ll be back. With three of Idaho’s public university presidents departing, Otter is backing changes in the state’s higher education system, including creating a new higher education CEO position. Meanwhile, the state still is struggling for progress toward its goal of getting more of its residents to go on to higher education after high school, and increasing college tuition and fees have raised concerns about college affordability. The state also is due to fund the fourth year in its five-year plan to improve K-12 public schools, including boosts to teacher pay. And there’s a continuing push to end Idaho’s distinction as one of just a handful of states with no state funding for early childhood education. All Idaho lawmakers will undergo mandatory “respectful workplace” training on the second day of the legislative session, as will other Statehouse workers including staffers, reporters and lobbyists. Policy changes are in the works regarding reporting procedures for harassment complaints, and Democrats are pushing to allow others – not just legislators themselves – to file ethics complaints. An interim legislative committee, with senators and representatives from both parties, has unanimously backed an ambitious update of Idaho’s sunshine laws, including requiring more frequent campaign finance reporting, imposing the state’s first personal financial disclosure requirement for elected officials, and revamping the Idaho Secretary of State’s online reporting system, aimed at more transparency. Legislative leaders from both parties said attention will be paid this session to the state’s prison issues. Those include an ongoing project to reserve prison cell space for the most dangerous offenders; coping with the state’s once again growing inmate population, including possibly shipping Idaho inmates to out-of-state private prisons; and a bipartisan push to re-examine the state’s mandatory minimum sentences. Published: Jan. 5, 2018, 8:51 p.m. Updated: Jan. 6, 2018, 10:16 p.m.